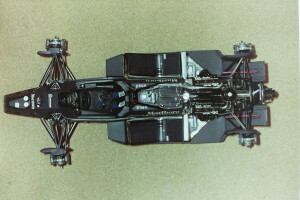 The MP4 series of cars originating in 1981 signalled all things new for McLaren; Ron Dennis’ Project 4 merger with McLaren, birth of McLaren International, first and strengthening involvement of John Barnard, first and increasing use of carbon fibre to bring about the definitive Hercules Aerospace carbon fibre monocoque (U.S. collaboration), formal strengthening of ties with Marlboro hence ‘M’ P4, the continuation of a Ford Cosworth powerplant while running a parallel program of integrating the Tag-financed Porsche turbocharged engines first running in late 1983, introduction of Alain Prost to replace the quite successful John Watson. Three World Championship wins for Niki Lauda in 1984 and Prost (1985 and ’86), the latter year in the MP4/2c which won four Grands Prix and epitomised the professor during fuel-calculation (newly restricted 195 fuel tank) to enable the most efficient and reliable finishes in the points and a calculating Championship victory. 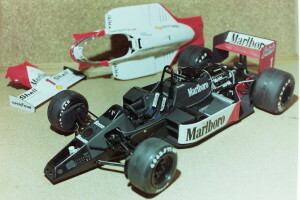 After the 1986 MP4/2C took to the tracks, John Barnard departed McLaren for Ferrari during that season, leaving the continuation design work to Steve Nichols and Tim Wright. That year concluded with the dramatic final Grand Prix in Adelaide (Australia) where Nigel Mansell’s leading Williams suffered unexpected rear tyre blow out. Prost’s better luck and more (puncture) careful approach saw him pit in time for new rubber and come through to a win and the secure the title as well. These photos exist from a time before common ownership of digital cameras (1995) and were scanned from negatives, hence the poorer than ideal quality. The model being one of Protar’s offerings is clearly substandard compared to a Tamiya kit. However the opportunity to build a more modern McLaren came in about 1995 and was a very successful one at that, also with a turbo engine and carbon fibre tub means that this kit was generally very popular. 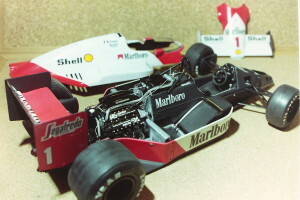 The parts are fairly ill-fitting, simply moulded and appear in soft-focus rather than the sharper results that Tamiya kits are blessed with. However, what a car, a real ‘must-have’ and it can be well super-detailed. 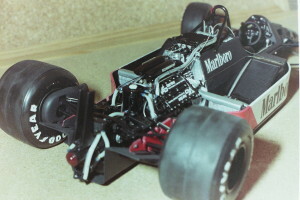 The tyres are not as good as a Tamiya but plenty good enough I would say and the engine etc is heavily simplified, but although the bodywork fits poorly, it has an overall good and reasonably ‘right’ look. If one is good with the various types and eras of Carbon fibre decals (some patterns and types used exclusively by different teams), I’m sure one could have a wonderful time with this kit, having said that, it looks great out of the box with electro-mechanical super-detailing also. 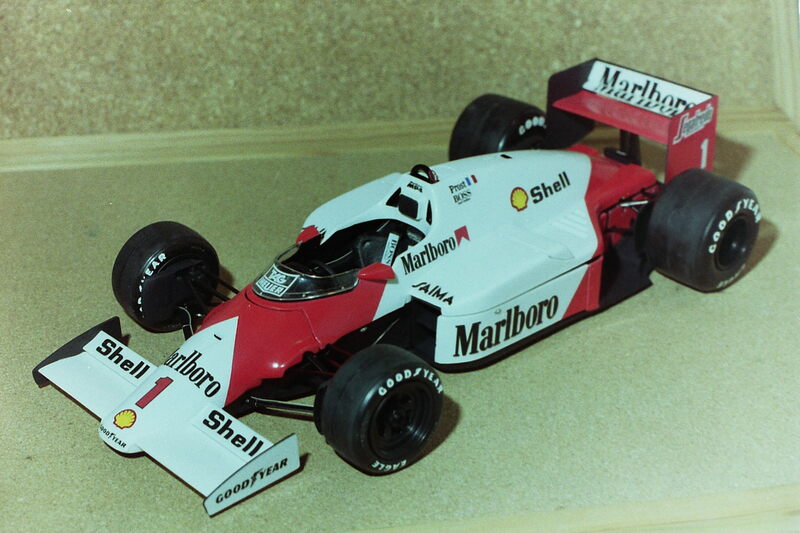 The provision of the Marlboro decals was a great success and really ‘makes’ the model. I first made my MP4/2C adding much super-detailing to the monocoque and engine, even the undertray, transforming it into something much more authentic. 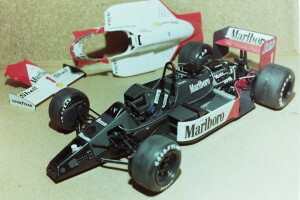 I enhanced the inner surfaces of the front and rear wing end-plates by adding paper photocopy of some carbon-fibre weave to great effect, lacquered with Acrylic varnish (Johnson Klear). Photographs of the car as originally built are hiding within an archive of negatives and some slides, so when the slide/negative scanner gets purchased, I will be anticipating providing some photographs. 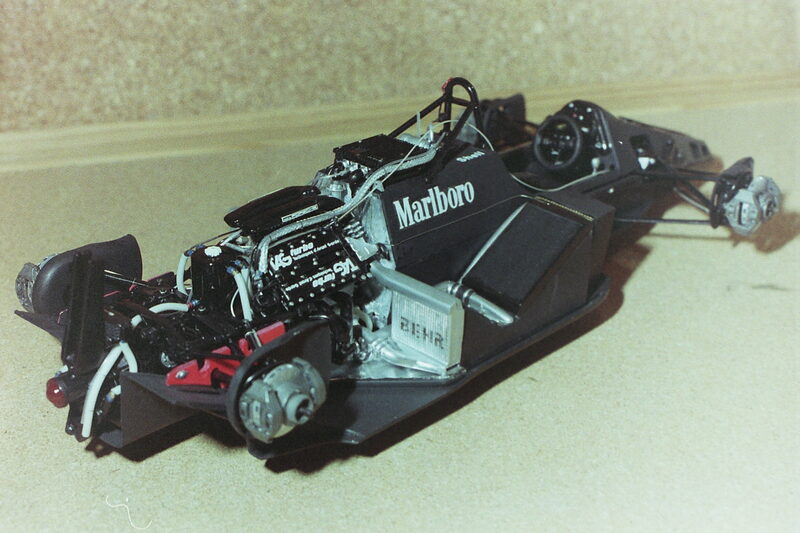 Since the model was built in circa 1995, having admired it for a few years, I took it apart in about 2004 I believe and completely took the bodywork back to base, filled all the sink holes, sorted out new dzus fasteners, replaced all the wing endplates etc and reprofiled certain parts and then resprayed it with Tamiya Fluorescent red paint, re-decaled it and it now awaits final construction (on display, as a work in progress), the original tub etc having being left as it was, nicely super-detailed. Consequentially, it’s potential is much greater than the original kit. For September 2013 the model was finally put together again, however without much substantial rebuilding and certainly not the total rebuild I would like to give it. The ‘catalyst’ was a very kind offer to attend with my models, an event exclusive to McLaren employees and their friends, namely the McLaren Employee Motor Show in August 2013. I was invited to attend this wonderful event held at the McLaren Technology Centre in Woking, by none other than Neil Trundle who was the other half of Rondel racing in the early 70’s, after which Ron Dennis got together with his backers and having formed Project 4 (also with Neil Trundle) bought out McLaren and forming McLaren International. After this successful event, I was asked to provide McLaren models for display at the McLaren 50th Anniversary celebrations in conjunction with the MOB, i.e. the McLaren Old Boys and Girls association held in September 2013. 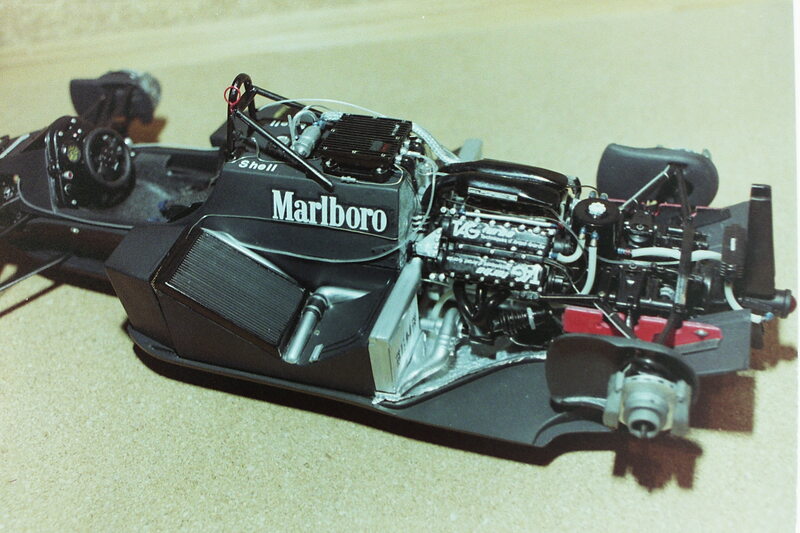 Along with the 1986 MP4/2C, I took along the M19C and the 1976 McLaren M23. I was able to repatriate Emerson Fittipaldi’s M23/5 from France (gift to Kerry Adams) and also the M23/3 which I had prepared for Jody Scheckter (1973 British Grand Prix). So MP4/2C having appeared at a British Racing Mechanics dinner in January 2014, it now resides in a display cabinet at home, but does require the magic touch of a full restoration.